Est. 580 calories Group 22 Created with Sketch. 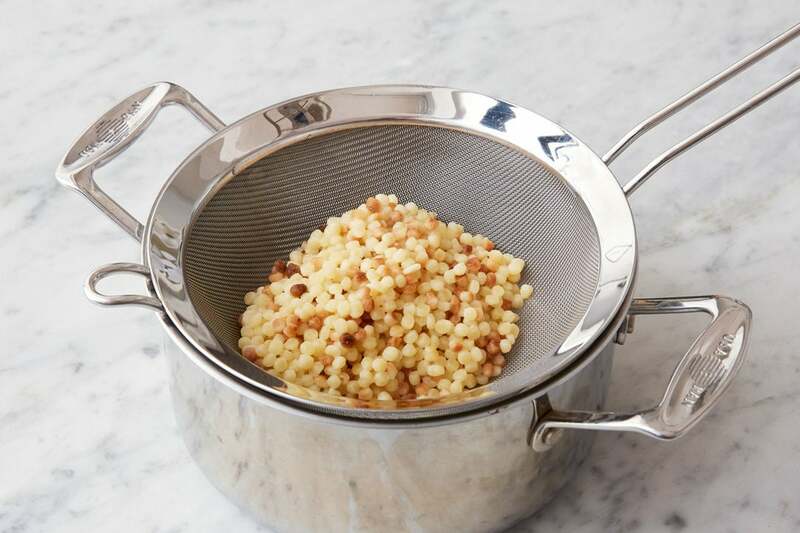 In this rustic Italian recipe, toasty fregola sarda pasta is a perfect match for briny olives and sweet raisins. 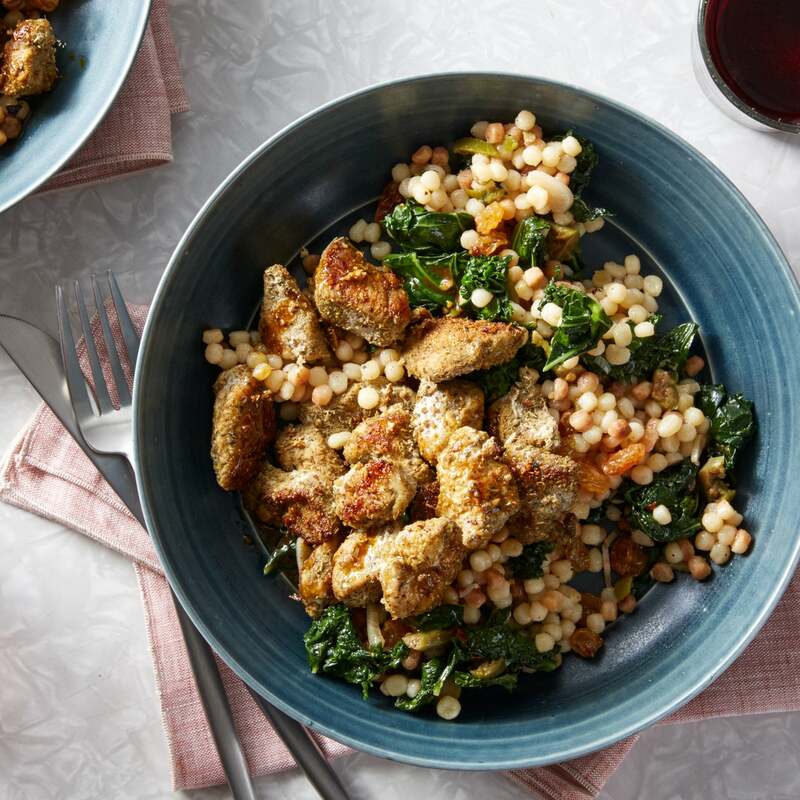 We’re topping it with chicken dusted with a warming blend of ground fennel, rosemary, and sage. 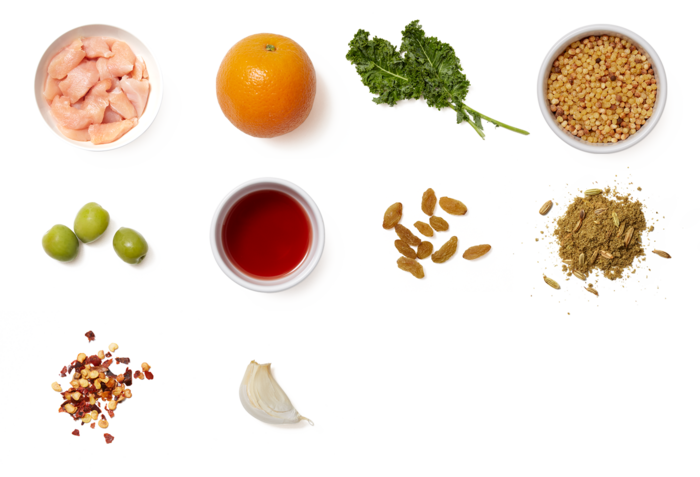 A seasonal orange vinaigrette finishes off the dish with more bright flavor. Heat a medium pot of salted water to boiling on high. Wash and dry the fresh produce. 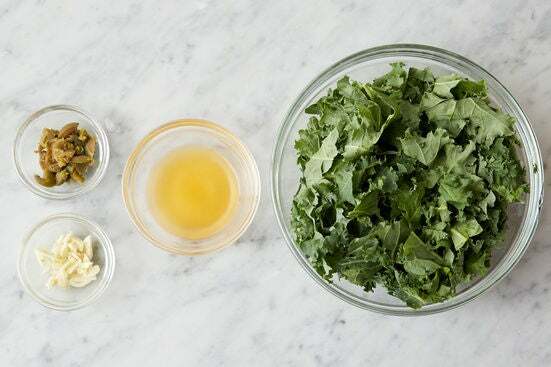 Remove and discard the stems of the kale; roughly chop the leaves. Peel and roughly chop the garlic. Halve the orange; squeeze the juice into a bowl, straining out any seeds. Using the flat side of your knife, smash the olives; remove and discard the pits, then roughly chop. Add the pasta to the pot of boiling water; cook 14 to 16 minutes, or until al dente (still slightly firm to the bite). Turn off the heat. Drain thoroughly and return to the pot. Cover to keep warm. 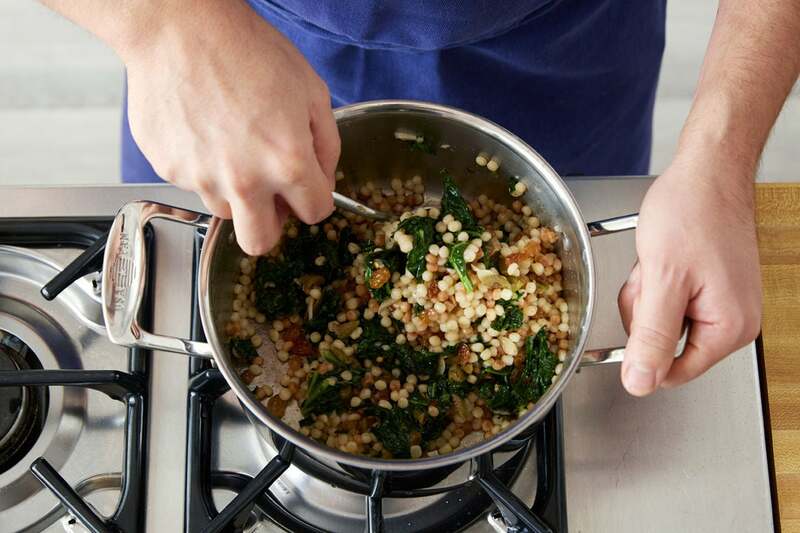 While the pasta cooks, in a medium pan, heat 2 teaspoons of olive oil on medium-high until hot. Add the chopped kale and garlic; season with salt and pepper. Cook, stirring frequently, 1 to 2 minutes, or until slightly wilted. Add as much of the red pepper flakes as you’d like, depending on how spicy you’d like the dish to be. Cook, stirring constantly, 30 seconds to 1 minute, or until thoroughly combined. Add 1/4 cup of water; season with salt and pepper. 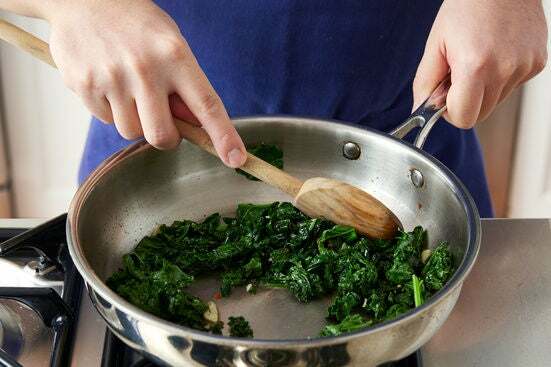 Cook, stirring frequently, 2 to 3 minutes, or until the kale is wilted and the water has cooked off. Transfer to a bowl and season with salt and pepper to taste. Cover with aluminum foil to keep warm. Wipe out the pan. 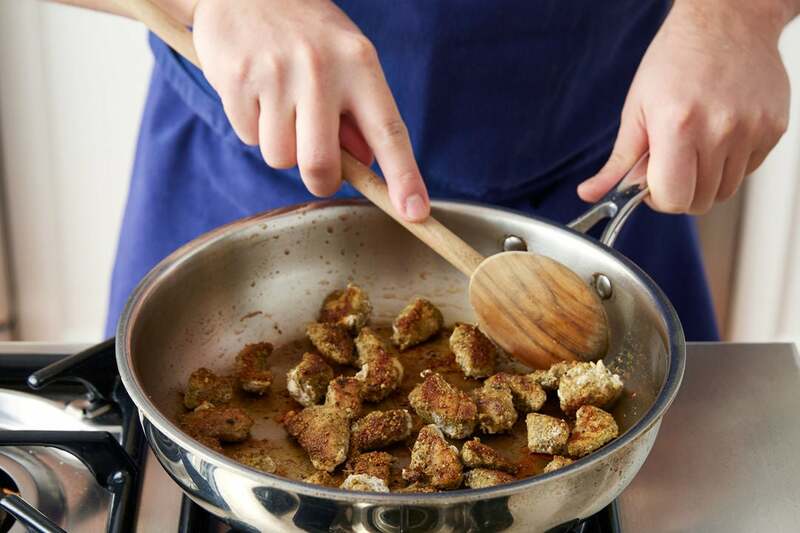 While the pasta continues to cook, pat the chicken dry with paper towels; place in a bowl and season with salt and pepper. Add up to 3/4 of the spice blend (you will have extra); toss to thoroughly coat. In the same pan, heat 2 teaspoons of olive oil on medium-high until hot. Add the seasoned chicken in an even layer. Cook, without stirring, 3 to 4 minutes, or until lightly browned. Continue to cook, stirring occasionally, 3 to 4 minutes, or until browned and cooked through. Leaving any browned bits (or fond) in the pan, transfer to a plate. 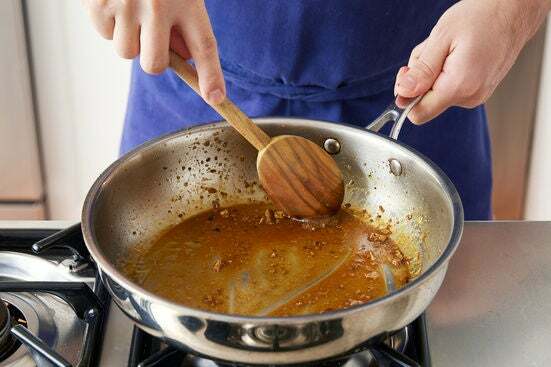 Add the orange juice and 2 tablespoons of water to the pan of reserved fond. Cook on medium-high, stirring occasionally and scraping up any fond, 1 to 2 minutes, or until slightly reduced in volume. Turn off the heat and stir in 2 teaspoons of olive oil until thoroughly combined. Season with salt and pepper to taste. To the pot of cooked pasta, add the cooked kale, chopped olives, raisins, and vinegar. Drizzle with olive oil and season with salt and pepper. Stir to combine. Season with salt and pepper to taste. Serve the finished pasta topped with the cooked chicken and vinaigrette. Enjoy!